Magazine hangs digital outdoor ad on latest Brexit vote. The Economist is capitalising on interest in the latest vote by parliament on the government’s Brexit deal today. 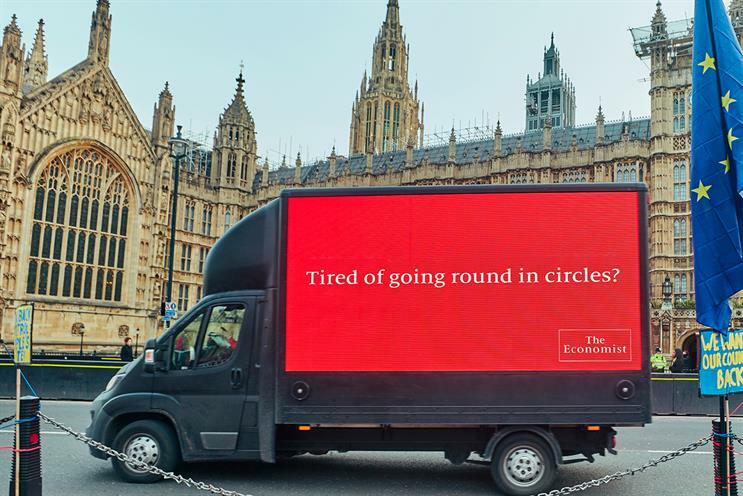 It has sent a van carrying a digital outdoor poster that displays the message: "Tired of going around in circles?" The vehicle is driving around Parliament Square from 8am this morning until the voting concludes tonight. The van will also display a URL, "Economist.com/directions", that points to an Economist article titled: "Theresa May has lost control of Brexit. Parliament must take over." The creative, by Abbott Mead Vickers BBDO, encourages passers-by to send a text message to receive a free copy of the magazine. Following defeat of Brexit deal, what's the best way forward for the country?